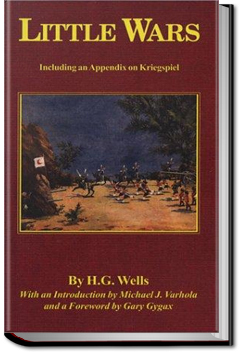 Miniature wargaming got its start with this thoroughly entertaining little account of how H.G. Wells, with certain of his friends, took their childhood toys and turned play into acceptable middle-aged sport by subjecting the exercise to the civilizing influence of actual rules. While wargaming progressed far past these beginnings, Wells observes how “little wars” with even his elementary rules can suggest the wholesale crudity of the real thing. Wells leaves almost hanging the tantalizing concept that we might someday simulate war, as an instrument of international decision-making, rather than practice actual combat. But most of this book is just the fun of evicting the boys from the playroom and spending happy days there, away from the “skirt-swishers”, developing the framework under which two gentlemen might meet and accumulate boastable victories! This entry was posted in Action/Adventure Books and tagged all you can books, audio books, books, download audio books, free audiobooks download, free ebooks for kindle, listen to books online free, unlimited action and adventure books on April 23, 2014 by allyoucanbooks.